After a bit of thinking, this is the best title I could have thought of. Yup. There’s so much goodness in this salad, that they won’t all fit in the title line. I think I mentioned this before, that my favourite salads are all a combination of both vegetables and fruits. The fruit always add a twist, a sweet kick to the dish. 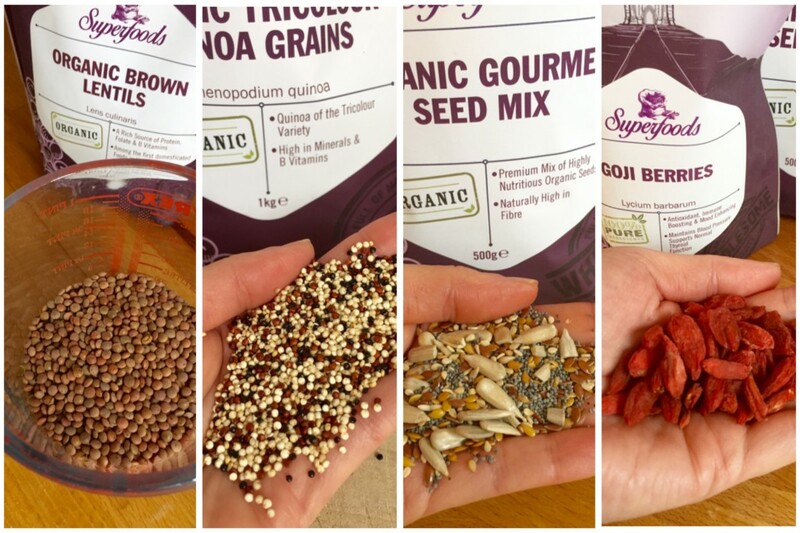 I love coming up with new and unusual combinations and keep varying my favourite, wholesome ingredients. 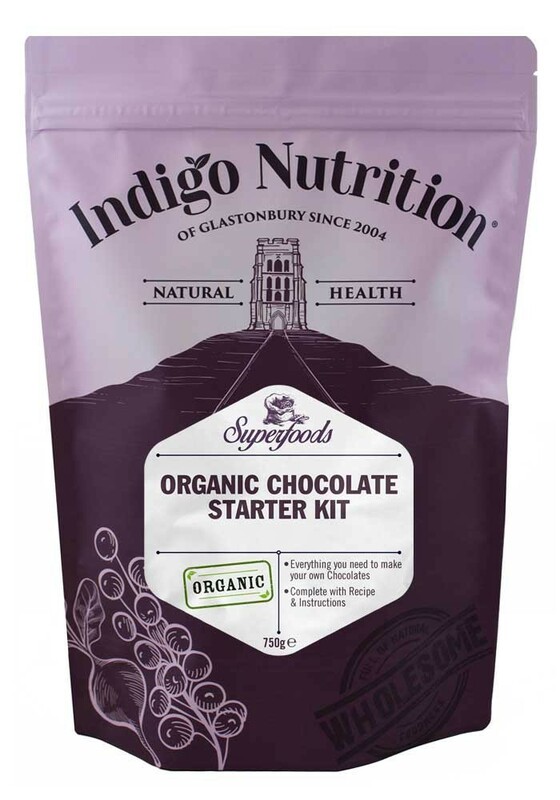 My favourite supplier for healthy and organic ingredients is Indigo Herbs Of Glastonbury and I discovered them last year (read about it here: Cristmas Bon Bons With Dates And Walnuts). For this recipe I used mainly their products. But why is this a SUPERFOOD salad? Because it contains an extremely dense concentration of vital nutrients, plant based protein (lentil and quinoa) vitamins (vitamin A, K, C, E, B6, B1, B2, manganese, copper, calcium, potassium, iron, magnesium – and that’s only KALE ), antioxidants, good fats (seed mix) healthy enzymes and fibre. The best thing about it, it’s not a big deal to prepare it. The only extra step is really to soak the lentils for about 2 hours before cooking. 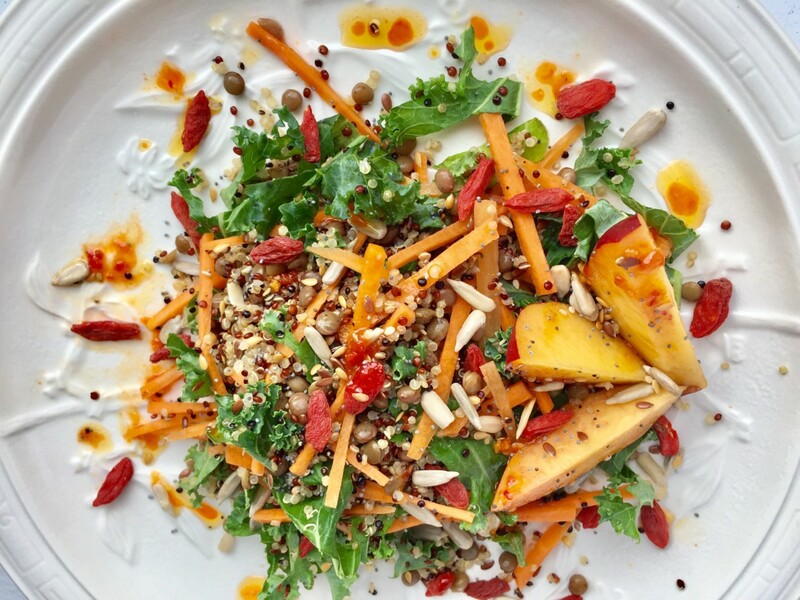 This superfood salad can be both a main meal or a side dish and also can be paired with practically anything. The recipe serves 4 people as a main dish. Before cooking, soak the lentils for 2 hours, it will reduce cooking time. Rinse them, add water and salt, then cook them for 30-40 minutes, until they are tender. At the same time you might want to cook the quinoa too: rinse it, add about double amount of water and some salt, then cook it for 15 minutes. They are ready when they loose their little “tail”. Julienne the carrot (cut them into matchstick size) and chop the kale. Prepare the dressing. Add them all to a salad bowl when the cooked ingredients cooled down and mix the dressing in. Cut the nectarines into long pieces. 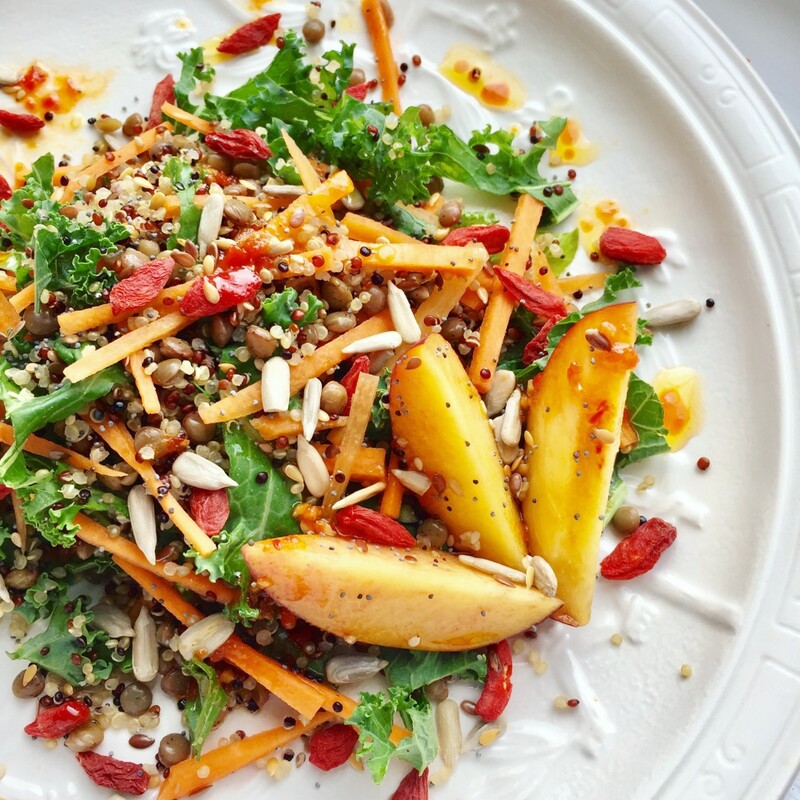 Serve it on a plate, adding the nectarines last, sprinkle with the mixed seeds and the goji berries. An Organic Chocolate Making Kit, complete with recipe and full ingredients! So you can make your own healthy and delicious chocolate at home. It’s very easy to use, you can’t possibly go wrong with it. 100% pure botanical ingredients, absolutely nothing added. This competition will open on 26th of July 2017 at 12:00 am and will close on 11th of August 2017 at 12.00 am. 1 winner will be selected at random. T he winner will be announced on Captainbobcat.com social media outlets and will be contacted by email. I love wispa golds ! My favourite chocolate is Cadburys. Really dark chocolate with no milk added at all when I can find it! That looks so good!! Galaxy caramel! My favorite chocolate is good milk chocolate, no favorite brand! This looks sooo pretty! It’s so funny because these are all things that I never eat nor do I think about eating/picking up at the market when I’m getting groceries. I really need to explore the world of superfoods more. i love any dark chocolate! I love salad! The combo you’ve created looks absolutely delicious. Big fan of lentils and quinoa in salads. I like fruit and nut at room temperature. Mmmmmmm such a hard decision as I love all chocolate but I would have to say ferrero rochers 🙂 Yummy! Anything involving praline is my favourite. I’m about to try making praline at home for the first time, so fingers crossed for that! I love dark chocolate, especially if it has flavours like cardamon or orange. I love ANY chocolate, but esp WHITE! I love anything that’s salted caramel! What a fab giveaway and recipe, I’ll have to try it, it looks so colourful! Thank you for liking up with #StayClassyMama, I hope you can join again next time! I love any type of mint chocolate! marzipan covered with dark chocolate! A real treat! Dark chocolate with orange is my favourite! Dark chocolate is my favourite . oh my goodness this salad looks so yummy! and pretty much guilt free!! Might be using this recipe before I go on my summer holidays! It is pretty much guilt free! Thanks for commenting. At the moment my favourite is Lindt Excellence 85%! I’m loving the Absolute black 100% chocolate range from Montezuma at the moment. It’s really intense and dark and is sugar free! If I’m really treating myself though I’d go for Ferrero Roche ? These look really good. I’m trying to eat myself healthy at the moment too. They’re also pretty local to me. Wahoo! My favourite chocolate at the moment is the vegan brand Moo Free. White chocolate but cetainly not fussy! I love very dark chocolate which I can then use in recipes as well as eating it while I cook! I love dark chocolate with a high cocoa %! I love Green and Blacks dark chocolate. I don’t have much of a sweeth tooth so dark is perfect. I genuinely couldn’t pick a favourite. There’s no chocolate I dislike. I even like marmite chocolate (yes that really is a thing). My favourite at the minute is peanut butter kitkat chunky ? the darker the better! And preferably organic. I am actually doing an elimination diet to figure out what is upsetting my stomach and I am always looking for recipes that would use only the ingredients I am allowed to eat. 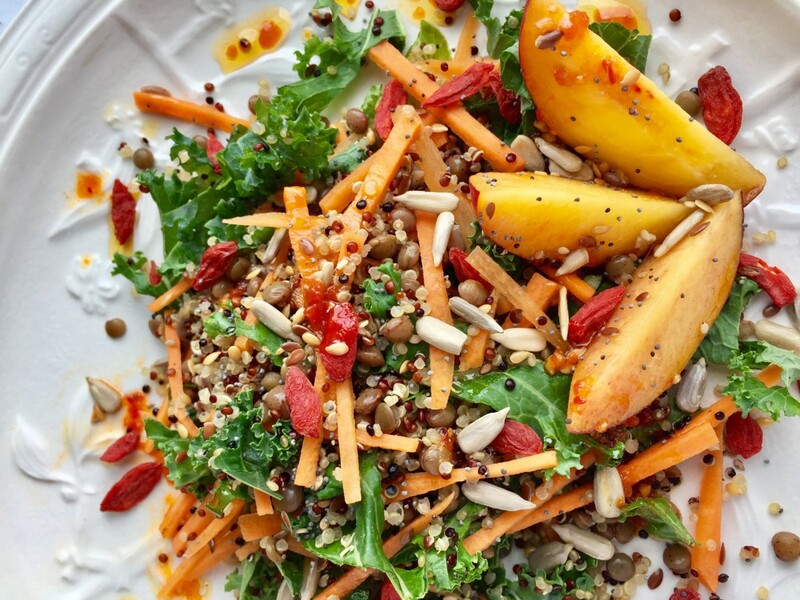 This salad would be perfect for lunch! So healthy!